Why is the option to "Delete Duplicates" greyed out? If you have purchased RealPlayer Plus or subscribed to RealTimes Premium or Unlimited, and you are signed in, you should be able to delete duplicate tracks in your player's music library. First, you will need to highlight at least two songs in your library (it doesn't matter if they are not duplicates). You will then be able to select Delete Duplicates and follow the prompts to clear duplicate tracks from your Library. 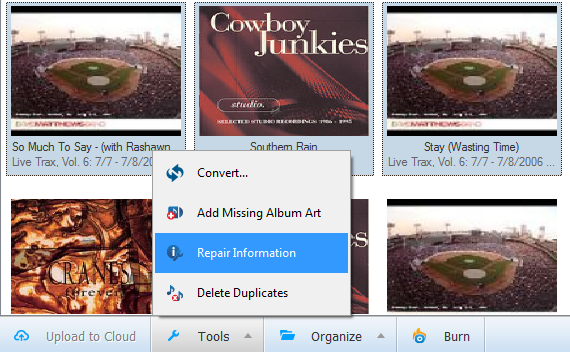 In RealTimes and RealPlayer Cloud, the Cleaner features can be found by highlighting one or more tracks in your music library—then click Tools at the bottom, and select the feature you wish to use.